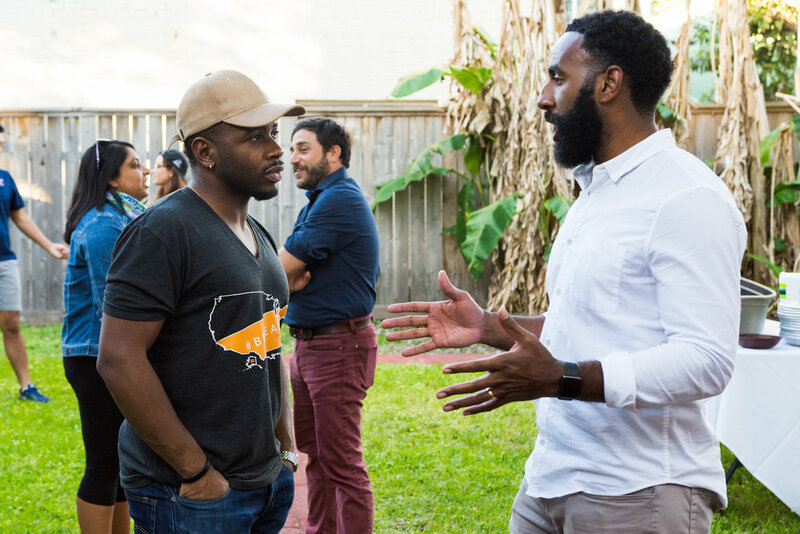 On the first night of Summit, we welcomed 13 social entrepreneurs to the Camelback house. After drinks and dinner, featuring Ms. Linda and her famous yakamein, we ask Fellows to share 4-minute pitches with their cohort. That night, I remember thinking, Damn. They’re good. The rest of the week showed me how hungry this cohort is, how ready they are to take on the world. I was humbled to sit in that room. It reminded me of these words from the great Dr. King: "I can never be what I ought to be, until you are what you ought to be. And you can never be what you ought to be until I am what I ought to be." Camelback Ventures is interconnected with the reality of our Fellows. Thinking back on that week, I want to take a moment to share a few reflections. This feels like one of the most high potential moments in my work with Camelback. The ventures’ ideas are strong. The leaders are good. I'm excited about what this group can do. And I am energized about what we can do to help them get there. Getting several of these entrepreneurs to great heights is completely within our grasp. We have 153 days to do amazing things together. Fellows are already utilizing learnings from our Summit to change their org. "After my first Summit with Camelback, I returned to my team and had a tough team decision to make. My gut instinct was that I had to fire someone. However, I read Who (a book we received at Summit) and applied the principles from the team building workshop...I looked at myself and recognized I probably didn't create the best circumstances that are in alignment with her abilities. I hired her potential, and I was not meeting her where she was at. So, we restructured the position and built in time for me to have development time and accountability. All around, it feels better -- there's still a lot for the org to grow, but this was a choice I wouldn't have made or known was an option before my Summit with Camelback. I'm excited to see how things go." The painful truth is that many leaders of color are shaped by tragedy; the glorious truth is how we mold this into power and courage to stand up again and continue the fight. 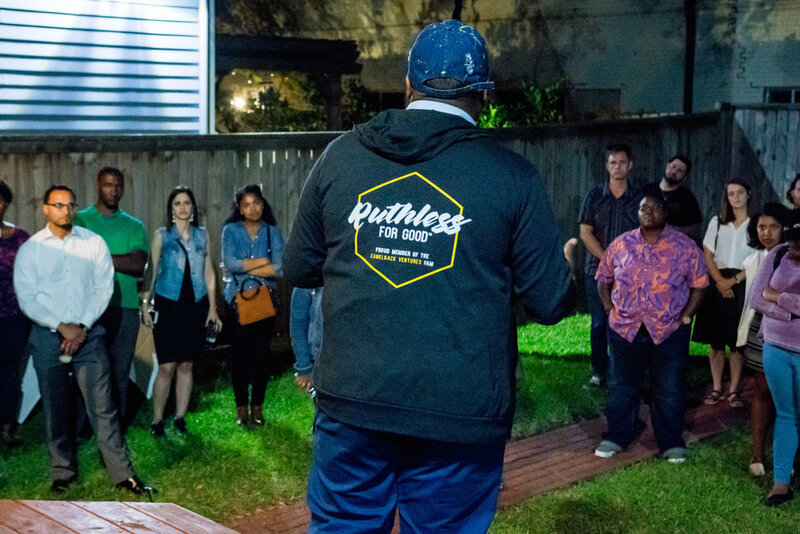 On that first night of Summit, during their pitches, Fellows demonstrated not only their existing skill with pitching their organization, but thoughtful vulnerability and expression of how the bad times drove them to creating change in their communities. For example, even though I already knew some of Brandon’s origin story, it hurt afresh as he shared how, while in the Army and on a deployment, the love of his life was killed by police violence. I can’t imagine that this story is easy for him to share, but he continues to be both vulnerable and strong to change systems of police violence against people of color in this country. These sentiments were echoed by other Fellows, such as Antionette and Myron, who remind us all why we must keep this work personal. Fellows Antionette and Nicole share a moment during a workshop. We can’t do this work alone. We got a lot appreciation from our partners this past week. David Aubrey from AT&T shared with us, “To us, Camelback epitomizes all that is good and right and exciting about this country,” at a luncheon we had celebrating their second year of follow-on funding, resulting in $350,000 of support. We held 3 separate roundtables, bringing in partners for discussions on nonprofits, for-profits, and schools, with many amazing friends joining us. * We continue to appreciate working in the 4.0 Schools co-working space where we can host our programs and work around great people. We get to work with great facilitators such as David Hamilton, our improv guru, and someone who I have a bias towards but to be fair, always receives 5-star ratings from Fellows: my better half, Ify Offor Walker, who leads a session on strategic hiring and team building. This year we got to bring our Startup Coaches with us for the beginning of Summit, and this was an exciting and impactful change. Our photographers are talented young men of color (including the insanely beautiful shots by Harlin Miller and the mission-aligned, high quality work of Gigsy). Thanks to all who came to our Crawfish Boil and to the Superior Seafood catering team for being such excellent event partners. Gratitude to LaShaun and the Pulp & Grind team for letting us hang out there all day right after the Summit for our GiveNOLA campaign. And of course, the Camelback team. None of it would be possible without the amazing people who have joined me on this journey. To Elizabeth, Mimie, Ami, and Amanda: thank you for making Summit 1 not only possible, but an invigorating start to the year. Our team is already busy working on Summit 2 which will be in late June in New York. Over the next week or two, we'll have the official profiles and headshots of the 2018 Fellows on our website and highlighting their work, so check back soon. We’re also doing a fair bit of traveling over the next few months. If you were at NSVF Summit, I hope you had a chance to say hi to our Fellows (I believe ~15 were in attendance?) and Mimie from our team. I’ll also be making a few stops across the country, including mid-May in Boston for New Profit’s Gathering, June 4 to support the inaugural pitch event for The Surge Institute, June 6 in D.C. for a NationSwell entrepreneurship event, StartingBloc’s New Orleans Institute (which Amanda will be attending and where I’ll be joined for a conversation with 2015 Fellow Jonathan Johnson), June 11-12 as co-host of Mosaic Genius with my friend and mentor Christal Jackson, and late June to speak at TOA in Berlin. And then of course, the great city of New York in late June for Summit 2.